Ribbon microphones have been around for decades and continue to be used in recording studios today for their smooth, natural sound unmatched by other microphone types. These mics function with a metal ribbon positioned between two strong magnets. When the ribbon moves inside of the magnetic field, energy is produced. Great for use with vocals and instruments of all kinds, ribbon mics have been used in the creation of several iconic tracks, as well as for broadcasting purposes throughout history. This device is able to transmit sound in a way that is similar to the way we hear sound with our own ears, allowing for a realistic recording. Additionally, instruments that emit sharp high sounds, such as percussion instruments, are evened out with ribbon microphones, creating a sound that is more pleasing to the ear. Ribbon microphones are incomparable to other mics available, but also tend to be very expensive. Luckily, select audio manufacturers have released affordable models that still produce a high level result for consumers on a budget. Read on to discover the best cheap ribbon mic for you. Ribbon microphones for sale today offer the same warm, natural tone as the first models did, but with enhanced durability and technical features. Below are the five best ribbon mics currently on the market. Apex Electronics is a company serving Canada and the United States with a range of advanced, durable, audio products. With a full selection of microphones, headphones, and accessories, Apex provides consumers with everything they need to successfully record music at an affordable price. Whether you require a device for stage, studio, broadcast, or conference, Apex is a reliable choice. The Apex 205 Compact Ribbon Microphone is one of the top products of its kind. Customers rave that this microphone can perform just as well as much more expensive alternatives.The ribbon is low-tension, made of pure aluminum, has a thickness of 2 microns, a length of 50 mm and a width of 5 mm. This allows for a widened low and high frequency response that sounds steady and organic, and well as precision in transmitting quick transients. The 205 has an asymmetrical figure-8 pickup pattern. This means that it has heightened sensitivity to the back of the mic, allowing for it to authentically recreate the reverberations and ambient sound of your recording space. Microphones with a ribbon element are notorious for being highly breakable. Apex has sought out a solution to this issue; the 205 mic can manage high sound pressure levels up to 165dB. In addition, an integrated yoke mic stand mount coupled with internal shock mount assembly ensures that the delicate ribbon is not damaged while the mic is in use. So, you can feel confident that your money is well spent on this sturdy microphone. The 205 weighs in at a light 1.8 pounds, making setup and storage easy. This has an outstanding price for a product of its caliber. Microphones with as stellar ratings and impressive features as the 205 rarely come at such an affordable price. Nady Systems was founded in 1976 by John Nady, an electronics engineer and musician who developed a revolutionary wireless companding process that still maintains prominence in the industry today. Since then, Nady products have been used for some of the most eminent television broadcasting applications around including the 1978 Grammy and Golden Globe Award shows. Today Nady offers a complete line of audio products, from headphones to amplifiers to microphones and more. Known for quality and innovation, it is no surprise that a microphone from Nady has made it onto this top products list. The Nady RSM-4 Ribbon Microphone is accessible for musicians of all kinds. This product is just about as inexpensive as this type of microphones can be. Despite its astonishingly low price, however, the RSM-4 offers the sought-after sound reproduction that ribbon elements are known for, along with multiple other attractive features. This product from Nady is ideal for both vocal and instrumental recording. The figure 8 polar pattern creates countless possibilities for microphone positioning and innovative recording approaches. Weighing just 12 ounces, it is one of the most lightweight options available, allowing for increased precision in its functionality. The large, low-tension ribbon element is constructed of pure aluminum; it is 6 microns thick and measures 45mm x 5mm. A progressive internal shock mount construction and machined housing keep the ribbon protected during use. With a SPL capability of 165 dB, the ribbon of the RSM-4 can handle much more powerful sound than earlier models could. The unique construction of a ribbon microphone allows for lengthened lows and highs, precise transient response, and an overall authenticity of sound. The RSM-4 mic puts forward all of these benefits with its top-quality components. The Nady RSM-4 microphone comes with a foam padded wooden storage box, microphone clip, and velvet drawstring storage bag for your convenience. The RSM-4 is a fantastic microphone for a variety of different needs, and especially for individuals on a budget. 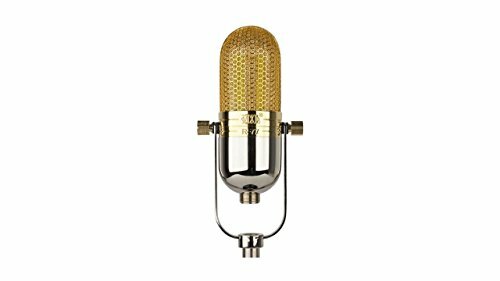 As the pro audio division of Marshall Electronics, a company that has been developing top-grade consumer and industrial electronics since the 1980s, MXL Microphones is backed by leading technology and a reputation for quality. As the chief distributor of the revolutionary Mogami cable in the world, audio products from Marshall Electronics offer clarity of sound that is unmatched by their competitors. The R144 Ribbon Microphone with Shockmount from MXL is no exception to this level of excellence; with an efficient setup and top-of-the-line technology, this device can meet a wide assortment of needs. The 1.8-micron thick aluminum ribbon of the R144 microphone creates a smooth, authentic sound transmission ideal for all different applications. From broadcasting purposes to vocals to instruments like horns and strings, the R144 is a fantastic choice. This microphone, like most with a ribbon element, has a figure-8 polar pattern. The mic is uniform in sensitivity to the front and back but blocks out most sound coming from the sides. Note that the manufacturer recommends testing out different positionings with the gain on a low setting so you can find the optimal mic placement without causing damage to your equipment or hearing. The R144 weighs 0.85 pounds, which is light enough to allow for for accurate sound directivity. The MXL R144 mic has a high SPL capacity that measures >130 dB at 1 kHz for 0.1% THD. While this does makes the device great for use with electric guitars and horns, you should note that it is a lesser SPL capability than some of its competitors. The R144 has been crafted with a purple and chrome metal finish for a sleek, singular look. Included with purchase are a shockmount, carrying case, and cleaning cloth. 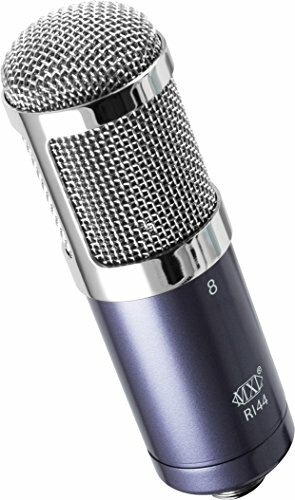 If you are searching for a higher-end microphone from MXL then you should take a look at the R77. This product is not the most budget-friendly option available. However, what it lacks in affordability it makes up for in efficiency and quality. Customers rave about its exceptional sound quality, especially with instruments like horns and electric guitars. The sound of these instruments are enhanced when used with the R77 because it smoothes out the notes that may sound jarring through a condenser microphone. The R77 also performs well with strings, acoustic instruments, vocals, and is great for broadcasting purposes. The glossy, vintage exterior of the R77 is certainly worth mentioning. A gold and chrome metal finish radiates elegance, while the classic structure will evoke a feeling of nostalgia from any old-school musician. This beautiful, one-of-a-kind model demands the respect it deserves. The R77 is aesthetically pleasing, but also holds up to a high level of technical standards. The aluminum ribbon element is 1.8 microns thick, creating a natural sound quality with a complete midrange and strong low end. The maximum SPL capacity is the same as the MXL R144 at >130 dB at 1kHz for 0.1% THD. Additionally, the figure-8 polar pattern rejects sound at a 90 degree angle to the mic’s axis while maintaining a high level of sensitivity to both the front and rear of the device. This setup creates numerous possibilities for recording by picking up sounds emitted in multiple areas of a room. Before purchasing this device, be advised that MXL suggests the use of a preamplifier with a low noise level, high gain, and input impedance of 1500 ohms or higher. The use of this type of preamp is a good idea because microphones with a ribbon element tend to have a relatively low output level. The main draw of the R77 is its inclusion of the Mogami cable. The top-notch wiring allows for outstanding sound reproduction that you won’t find with other products. The R77 is undoubtedly a major investment, but if your budget can accommodate it, this model has several attractive qualities that can satisfy the high standards of a professional musician. Samson has been developing top-notch wireless microphone systems since 1980. Today this company operates at a global level, providing an array of advanced audio products for both the music and broadcasting industries. Samson Technologies is comprised of three respected brands: Samson Audio, Samson Wireless, and Hartke. Together, these brands distribute more than 250 different products to over 140 countries worldwide. One such product, the VR88 Velocity Ribbon Microphone, is a standout in its field for efficient construction and impressive sound sensitivity. The VR88 mic aims to provide consumers with the benefits of a classic device combined with progressive electronics to satisfy an assortments of needs. It has a 2.5 micron aluminum ribbon positioned between powerful neodymium magnets, producing a very low level of self-noise for a clean, precise transmission. Like most of its competitors, the VR88 features a figure-8 polar pickup pattern. It is highly sensitive to the front and rear with exceptional off-axis rejection for countless recording possibilities. Know that the maximum SPL level for this device is 135dB, which will suffice for the majority of consumers but is not the best that you can find. This microphone from Samson brings a warm, authentic tone to numerous applications both onstage and in the studio. From vocals to electric guitars, acoustic instruments to drums, the VR88 is a solid choice for all types of musicians. It even comes with a shock mount and carrying case for added convenience. The VR88 is one of the more expensive options on this list. Despite that fact, it is still considered an affordable price for a top-caliber ribbon microphone. Ribbon microphones are special, and the sound quality they produce is highly sought-after. However, before owning this type of mic, you should understand the care that must go into its maintenance. The ribbon that allows the mic to function is thin and delicate. Anything from a forceful rush of air to a sudden change in voltage can damage the ribbon- even a normal exhalation from a vocalist can cause breakage. Be aware of the distance between the sound source and the mic at all times to make sure the ribbon will be able to handle the level of sound energy in the room. Also be conscious of the way that your microphone is stored. Storing the device on its side can wreck the ribbon. Newer microphones are built to withstand more wear and tear than older models, but are still very sensitive compared to other types of microphones. You will notice that many microphones include some type of case for transport and storage. If the product you select does not come with some protective case, bag, or sleeve, make sure to find another way of covering the mic when it is not actively being used. As previously mentioned, the ribbon could get damaged just by air blowing through it as it is moved from one area to another. In order to maintain a functioning microphone for years to come, you need to take every possible safety precaution. It is important to note that ribbon microphones typically have a low output level, especially compared to a condenser microphone. So, you may need to use a preamplifier with a high voltage gain level. The use of a preamp will strengthen the microphone’s signal so that it can be clearly picked up in a recording or easily heard in a live application. As a specific kind of microphone, ribbon mics tend to not vary greatly from product to product. Many characteristics, such as ribbon material, polar pattern, and general sound quality remain basically the same. Ribbon microphones can vary, however, in their shape. The two main microphone shapes are round and pencil. Pencil style microphones are shaped as the name suggests, with a long, narrow body. This design only admits sound from one direction- you must position the mic toward the desired sound source. One benefit to this setup is that the transmission of unwanted sound is minimized by the limited pickup area. If you are recording in a space that is not well sound-proofed or has an excess of ambient noise, a pencil mic could be a good choice. Also, the pencil design tends to procure a very clear, precise sound which is often desired in broadcasting or other applications which are central to a singular sound source. A pencil mic would not be ideal for applications that are less straightforward--in the recording studio, ambient sound is often what makes a record unique. The narrow focus of a pencil shaped mic can eliminate possibilities for creativity in certain situations. Cheap ribbon mics are not a simple product to come by. Due to their delicate construction ribbon microphones can cost several hundred dollars, with some models having a price tag surpassing a thousand dollars. Thankfully, affordable microphones have become available in recent years. Whether you budget is under or over $100, this article has provided you with multiple options of advanced and highly rated microphones to choose from. Priorities differ from consumer to consumer, so determine which features are the most important to you before making a final purchasing decision. Are you looking for durability? Is sound sensitivity your primary concern? 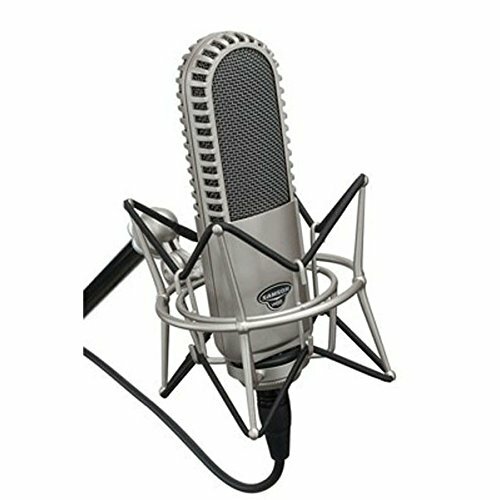 Whatever that determining factor may be, you are well on your way to finding the best ribbon mic to fit your lifestyle.